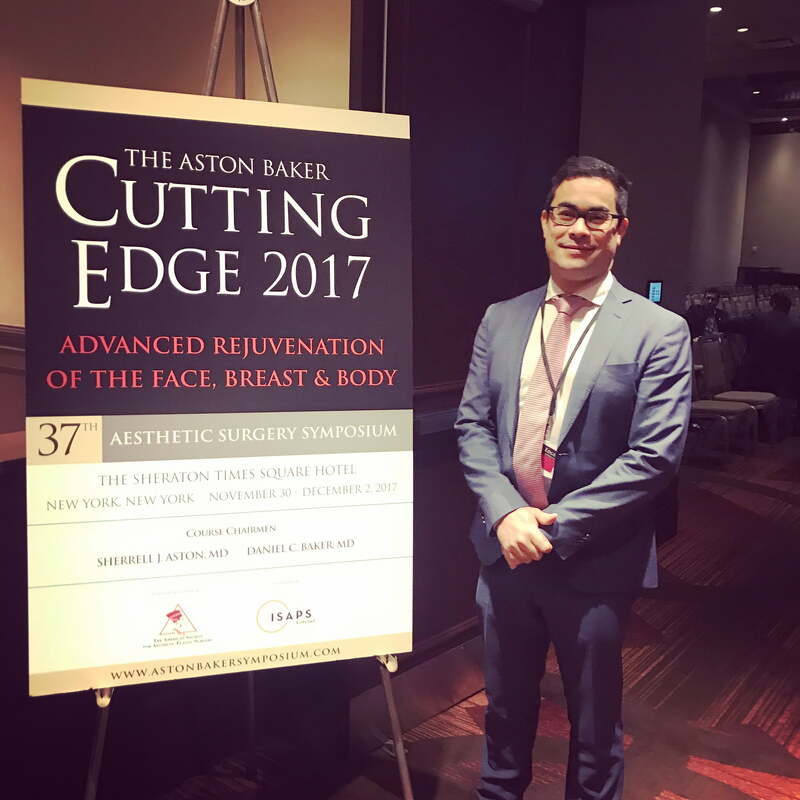 The Aston Baker Cutting Edge Aesthetic Surgery Symposium has been running for 37 years and brings together some of the world’s leading aesthetic plastic surgeons. This year, Dr Sharp and practice director Liz Washington joined hundreds of plastic surgeons and their clinic teams to learn more about the innovative techniques for facial and body rejuvenation. The program featured 94 instructive surgical videos, 26 presentations, 13 expert panels and 8 debates. Dr Sharp loves being abreast of the latest advancements in plastic and cosmetic surgery, and these forums provide a valuable opportunity to hear about the techniques, trials, anecdotal experiences and standards from across the world. The overall message from the symposium was: aesthetic surgery has changed, and the over-stretched, over-enhanced, over-done look is a thing of the past. Progressive surgeons are working together to develop new techniques to approach cosmetic surgery to achieve a more balanced, proportionate and natural look than ever before. We thought some of our patients may be curious to hear more about the ideas discussed, so in these videos, Liz briefly covers some of the symposium topics that often arise in our discussions with patients. Fat grafting has been used for reconstructive purposes for many decades, but its use for rejuvenation and enhancement is still a relatively new concept, and something that surgeons are still experimenting with to perfect and hone the right technique for different areas of the body. We saw some exciting results from the panel, and of particular interest was ‘micro’ and ‘nano’ fat grafting for facial rejuvenation, which is providing not just volume replacement, but also dermal rejuvenation. The faculty also addressed the hype surrounding stem cell enriched fat grafting, urging caution until there is more peer reviewed research on the treatment. There’s still a lot that is scientifically unknown about fat grafting and the general message was that we still don’t know enough about the long term risks of stem cell enriched fat grafting for aesthetic purposes. It’s hoped that current research being undertaken will shed more light. The longevity and potential complications of both fat grafting and dermal fillers was also discussed, with some surgeons indicating a preference for fat injections for facial rejuvenation and others favouring the predictability of dermal fillers. Panellists generally agreed that – while fat grafting results can look great for the first 4 - 6 months – about 50% of transferred fat dies off after the procedure, additional fat transfers are often required to achieve the patient’s desired result. Traditional invasive brow lift procedures are reportedly dropping by 70% in the US, with some surgeons stating that cosmetic wrinkle injections are helping to stave off surgery by smoothing the forehead and subtly lifting the brow - along with a preference towards less invasive endoscopic brow lifting techniques. This discussion underlined the importance of choosing a surgeon who is familiar with progressive techniques. Upper lid blepharoplasty discussions focused on the aesthetic goals for different ethnicities to retain a natural look, and the resection of skin, fat and muscle depending on the patient’s anatomy. It emphasised the importance of tailoring each procedure to the patient, and having a surgeon that feels confident with a range of techniques to make small adjustments to the structures and tissues around the eye, to provide an optimal result. Lower lid blepharoplasty (or canthoplasty and canthopexy) is performed less than upper blepharoplasty surgery; it carries greater risk of complications and disfigurement. Nonetheless it is in demand, particularly among patients who want to address sagging and hollowing under their eyes. It was interesting to hear the panel discuss their varying approaches - some of which are hybrids of common techniques - to help reduce the chance of complications and provide a natural looking result. Modern facelift surgery has moved leaps and bounds beyond the former ‘stretched back’ look seen in decades past, evolving into a more technically complex and nuanced procedure, so this was a very exciting segment of the program. In facial aging, changes are commonly represented by ‘vectors’, of which gravity, actinic damage, and natural aging contribute to soft-tissue ptosis (sagging). The panel shared their preferred optimal incision points, repositioning of fat pads, the use of flaps and the various depths and vectors they use for different facial types and age groups. Also discussed was the use of laser for both scar reduction and dermal rejuvenation in conjunction with facelift surgery; something our patients routinely undergo as part of their facelift journey. It was also great to see that the SMAS technique most commonly used by Dr Sharp is considered the gold standard. A sagging neck and undefined jawline is one of the first signs of ageing that people notice; and one of the most commonly enquired about facial areas in our clinics. Creating noticeable, but natural, results in this area can be challenging due to the underlying structures and the fact that large, visible incisions in this area aren’t desirable and residual skin laxity and visible bands can cause dissatisfaction post operatively. The panel discussed both open and endoscopic techniques for neck lift (or platysmaplasty) to sculpt the neck, and demonstrated some hybrid techniques to provide skin reduction and contouring without large visible incisions. The second day kicked off with debates about the functional and aesthetic benefits of smooth vs textured implants, and then a discussion about subpectoral (under muscle), subglandular (above muscle) and dual plane placements . It was interesting to hear about the increased use of a combination of both implants and fat grafting for selected patients - the benefits, and the challenges that fat graft reabsorption can pose for long term results. Fat grafting is also used sometimes for mastopexies where upper pole fullness is often lacking; certainly amongst the US panellists it appeared that fat grafting is currently being used more commonly than it is here in Australia for cosmetic breast enhancement. There was an update on BIA-ALCL, with rates continuing to remain extremely low. The faculty reported that there had been 360 cases and approximately 15 deaths worldwide. The importance of following the 14 point plan pioneered by Australian plastic surgeons, and which Dr Sharp has committed to, was emphasised as a way to reduce the risk of BIA-ALCL occuring. Dermal matrix, which Dr Sharp uses for reconstructive as well as breast augmentation revision surgery, was discussed as its uses for a wider range of applications in breast surgery continue to be explored. Patients often ask us if it’s possible to perform a breast reduction or lift using a periareola incision (an incision around the areola only). While the appeal of this incision is understandable, resulting in less scarring, it was emphasised that this technique is rarely suitable for large breast reductions or lifts, and often results in dissatisfaction as it limits the amount of breast tissue and skin that can be reduced. It was interesting to observe techniques being used to utilise existing breast tissue to build shape and volume during a breast reduction or lift. Liposuction is commonly performed Australia, but greatly eclipsed by the scale of the procedures performed in the US. It was interesting to note that it was more routinely performed under twilight or sedation and local anaesthetic, whereas in Australia it is usually performed in accredited hospital facilities under general anaesthetic. Anecdotally, it was noted that contour deformities (the irregularities that can sometimes be observed after liposuction) occur in up to 20% of patients and that patients should be prepared for the possibility of two liposuction procedures to achieve the look they desire. With the emergence of high profile SnapChat and Instagram lipo sculpting surgeons in recent years, it was good to note that most speakers emphasised that the great before and after results we see are usually only achieved through a combination of weightloss, workouts, diet and lifestyle change and liposuction - rather than purely being in the hands of the surgeon alone. Being motivated and investing in lifestyle change as well as surgery was integral to good results. The benefits and challenges of large volume fat grafting and buttock implants was discussed on day three of the symposium, with different liposuction methods compared and discussed. It was recognised that different ethnicities and body shapes compliment different buttock ideals, and that aiming to sculpt a typically Latino shaped buttock on a Caucasian male or female is unrealistic. This procedure is more popular in the US than Australia, and it was interesting to hear surgeons who see large volumes of buttock augmentation patients evaluating the risks of this procedure, and the long term results. Thanks to the Cutting Edge faculty for hosting a highly informative and thought provoking event.